Just for those who maybe haven’t played Warhammer 40,000, or read any of its lore, the Tyranids are a race of bio-engineered life forms that move from galaxy to galaxy harvesting all forms of biological life, which they then strip apart and remake into more Tyranids. They’re what would happen if the Xenomorph from Alien was only one kind of alien in a vast army of gnashing teeth and sharp claws. 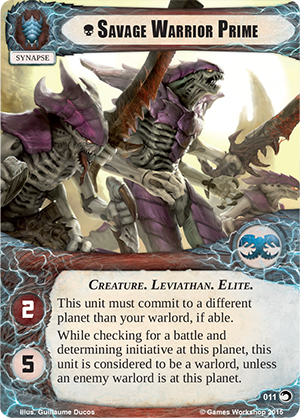 The Tyranids are going to be a unique faction in that they can’t take any allies; a Tyranids deck will contain only Tyranid cards. That’s not to say they’re going to have any trouble as Tyranids have a couple of new tricks up their... sleeve? The first new tool is the Synapse unit. Synapse units represent the leader units in the Tyranid army that are needed to carry the Hivemind’s commands to the rest of the forces. Their downside is that they are essential to co-ordinate your troops, the bonus, they act like a second commander and allow you to start battles on multiple planets. 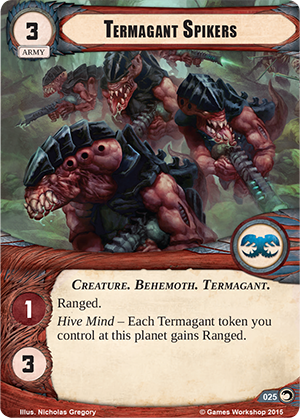 It’s not a Tyranid army without hundreds of Termagants and these will act like the other small card troops with the other factions. 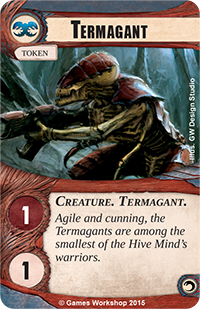 However Termagants can be boosted with special cards that add bonuses to ALL the termagants. 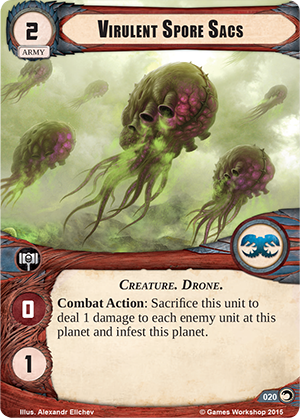 If you’re not planning on playing Tyranids there’s still something for you in The Great Devourer. Each faction will also get two new cards. Yes you read that right, 2 new cards, you get 3 of each. It might be a bit stingy but if they’re really good cards its worth it right? This may seem a weird thing to say but I actually think it’s a bit early in Conquest’s life to be bringing out any new factions. I know Tyranids and Necrons have been promised from the start, and it’s not a 40k game without everyone complaining that their favourite faction isn’t available but I was hoping we’d have a bit more fleshing out of the current factions first. Especially with the lack of card variety in the core set. However, it does follow Fantasy Flight Games standard release program for their LCGs so was to be expected I suppose. So who’s going to be playing the dirty cheating Tyranids?